It was with great pleasure that the Bryant Park Corporation opened the park’s lawn to the public last Friday, for the first time in 2012. The weather was perfect: sunny, warm, just a bit of a breeze, and patrons wasted no time in taking their first walk, or seat, on the lawn since last October. John Elliott of WCBS-2 TV was on hand to perform the honors of officially opening midtown’s largest expanse of greensward, and visitors enjoyed a concert performed by Swear and Shake. This is shaping up to be a great year for BP’s lawn. You might remember that we opened it a bit later than usual last year, after completing major projects to upgrade the irrigation and drainage systems. Now, with a season of experience with the new systems under our belt, and a warm sunny spring that helped the new sod establish strong roots quickly, we’re poised for a long, warm season of lawn days that will stretch to October. With the lawn now officially open, two more big events at Bryant Park this week signal that spring has unequivocally sprung. On Thursday, April 26, Poem in Your Pocket Day kicks off the 2012 Word for Word season at the Bryant Park Reading Room. Everyone is invited to come to this annual celebration of verse. Daniel Kitrosser returns to emcee a jam-packed program that includes music by singer-songwriter-violinist Aurora Barnes and guest poet Mahogany Browne; an appearance by NYC 2012 Youth Poet Laureate Ishmael "Ish" Islam; readings by young poets from the Community Word Project, Urban Word NYC, and Writopia Lab; and, of course, Open Mic, when young poets from nine area elementary, middle, and high schools take the stage to read their own work. This event runs from 11:00am-2:00pm. Then on Saturday, April 28, Bryant Park once again serves as NYC host for World Tai Chi Day. As has become a tradition, Master Chu from Manhattan’s Tai Chi Chuan Center demonstrates the Tai Chi Short Form continuously for three hours (11:00am-2:00pm) at the Fountain Terrace. Everyone is welcome to come and take part or to just watch. Also on Saturday, April 28, we introduce a new program: Bryant Park Fly Fishing. This is a great chance for urbanites to learn the basics of fly-fishing and outfit rigging for no charge. Experts from Orvis will conduct the classes, which will be held at the Fifth Avenue Terrace at 41st Street, in front of the New York Public Library. The sessions run from 10:00am-12:00pm each Saturday through June 30 (except May 19 and June 9). Class spots are first-come, first-serve, so please call Orvis at 212-827-0698 to reserve your place. And next week, BP’s most popular free classes make their 2012 debuts. Tai chi classes, conducted by masters from Tai Chi Chuan Center, return on Tuesday, May 1. This year, once again, we offer two classes each week, at 7:30-8:30am on Tuesdays and Thursdays, at the Fountain Terrace, through September 27. Remember to wear comfortable clothes and shoes. 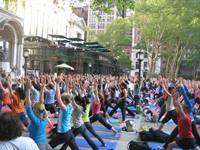 And Bryant Park Yoga, our fantastically popular free yoga program, returns on Tuesday, May 1 as well. Conducted by instructors provided by lululemon athletica, the classes are at 10:00-11:00am on Tuesdays on the Upper Terrace, and at 6:00-7:00pm on Thursdays on the lawn through September 27. We supply some mats, but remember, these classes attract a lot of people so if you have your own mat, please bring it. With all this going on at Bryant Park, don’t take any chances. Consult the Calendar of Events at our website regularly, or better yet, subscribe to our weekly events update. Judging by its popularity and amount of buzz created, the Sephora + Pantone Color Pop-Up Shop held at the Chelsea Triangle in March was an unqualified smash. Thousands of people came by, hundreds of whom “tried on” different versions of Pantone’s color of the year (Tangerine Tango), and many walked away with great stuff. As big a hit as it was for the public, the Pop-Up Shop was even more impressive to fashion blogs, as it garnered mentions on Vogue, Racked, New York Nearsay, The New York Times, The Fashion Spot, Beauty Stat, Yelp, Refinery 29, and Haute Living. Most recently, acclaim came from the design world. Design Boom, a website dedicated to urban design and frequented by Chelsea Improvement Company’s own Ignacio Ciocchini, recently ran a lengthy blog post about the design of the Pop-Up Shop. The article includes extensive descriptions of the Pop-Up Shop as well as several excellent photos taken from different viewpoints and times of day. As you can tell from these pix, the Chelsea Triangle provides an excellent urban stage for a product launch, promotional event, or photo/video shoot. If your company is looking for such a stage, just visit CIC’s website. You still have time to participate in the 34th Street Partnership’s 2012 Community Satisfaction Survey. Your opinion is important to us – it helps us know what we’re doing well and what we can improve upon. And remember, anyone who completes a survey this year has the chance to win a generous gift card to one of seven local establishments: B&H Photo, Foley's Pub, Heartland Brewery, Jack Demsey's Pub, Legends NYC, Stout NYC, and Féile. If you are a member of the 34thStreet Partnership, work in the district, live here, or just spend time here, we want to hear from you! You can fill out the survey online here. All surveys must be received by 5:00pm EDT, Monday, April 30. Whether referred to as an “Open Air Library” or a “Reading Room”, the idea of offering visitors to Bryant Park the free use of newspapers, magazines, and books, was a logical one. After all, the park was named after a man who was a poet and a publisher, and it lies adjacent to one of the most famous libraries in the world, the magnificent New York Public Library. In fact, the park has had two incarnations of such a place – today’s Reading Room, and, beginning back in the 1930’s, the first Bryant Park Open Air Library. 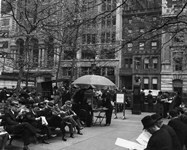 The first free reading outpost at Bryant Park was instituted in August 1935, just about one year after the renovation was directed by then-Parks Commissioner Robert Moses. 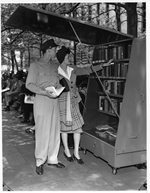 The Open Air Library was directed by “Miss Ruth Wellman”, superintendent of NYPL’s extension division, staffed by workers from the New Deal-era Works Progress Administration, and stocked with books supplied by NYPL and magazines donated by merchants and citizens. Its very existence was a frank comment on the times: it was meant to provide out-of-work businessmen and intellectual workers a place to read for free. It originally consisted of several benches, book and magazine racks, and five beach umbrellas for the staff, who worked six days a week from mid-morning until mid-evening. An article in the New York Times about the first day was not given to optimism about the venture: ‘Park Sitters Shun Open-Air Library’ ran the title. The body of the article explained how park visitors were satisfied with their own newspapers, and didn’t rush the table to take out books. The indefatigable Miss Williams was described as directing her staff to fan out over the park to spread the word that free reading materials were available. In an interesting aside, a snickering on-duty police was quoted as wondering just how many books would be “borrowed permanently.” To which the WPA aides responded, in unison: “The civic responsibility of New York’s citizens was all the assurance one needed of the volumes’ safety.” Those were wise words, and the aides’ faith was justified by an extremely low “missing” rate throughout the Open Air Library’s history. The Open Air Library was a success for its time. At a 1940 celebration marking its fifth anniversary, NYPL Director Harry M. Lydenberg told the NY Times that 350,000 park visitors had borrowed the facility’s 400 books and 1,000 magazines. 1940 was the last full peacetime year in the U.S. for a half-decade. With World War II came conscription and full employment, and the very rationale for creating the original Open Air Library disappeared: there were very few people with nothing to do. It closed quietly after the 1944 season. It would not be until 2003 that the idea to bring this wonderful institution back to the park became reality. Bryant Park’s Spring Birding Tours picked up the pace on Monday, April 16. Fourteen birders were on hand to record 16 “gets”. The species spotted included: Hermit Thrush, Ruby-crowned Kinglet, Brown Thrasher, Swamp Sparrow, Song Sparrow, Chipping Sparrow, Dark-eyed Junco, Eastern Towhee, White-throated Sparrow (photo by Mike Kosniowski), American Robin, Grey Catbird, Rock Pigeon, House Sparrow, the uncommon Field Sparrow, and, for the very first time at BP Birding Tours, the Savannah Sparrow. By the way, we keep an up-to-the-minute record of bird sightings from our weekly tours over at the Bryant Park Blog.